Books about the historical role of the bicycle are always a fascinating read for me. Just when you think that everything has been uncovered, nuggets of historical goodness are dug up, cleaned and polished for all the world to see. At first glance, the title seems a bit optimistic. Surely there can't be THAT much to write about on the subject. The Bicycle and the Bush, however, is filled with brilliant stories, anecdotes and historical references. Australia is in no way a shining light for bicycle culture in a modern context but what an astonishing role the bicycle played in building the nation between 1890-1920. It never ceases to amaze me when writers produce a work that requires so much research. In addition to a constant flow of nuggets, the book is richly illustrated. 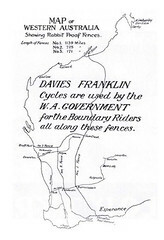 At left: An advert from 1895 for a bicycle messenger company serving the towns in the goldfields of Western Australia. We're not talking about the Village to Madison Avenue here. This is REAL bicycle messenger stuff. Pony Express go home. 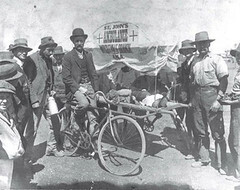 At right: A bicycle ambulance that ran between Cobar and Wrightville in New South Wales. This photo is from 1904. Here's a map of the rabbit fences in Western Australia. The maintenance was done on bicycles along the routes. 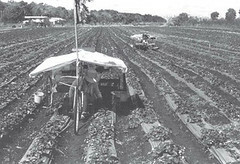 At left: Strawberry pickers on an early version of the recumbent. This version actually had a purpose. At right: A bicycle on the border between Queensland and Northern Territory in 1910. Workers, including sheep shearers, used the bicycle to travel around. 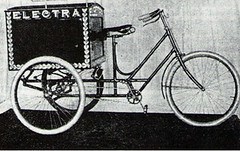 At left: An early cargo bike in Australia. At right: The insurance industry - just like today - was keen to shock people into buying insurance. 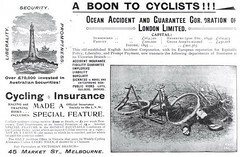 An early Culture of Fear advert for bicycle insurance. The Bicycle and the Bush looks at the bicycle’s use in rural Australia from 1890-1920. It is one of the most unusual, innovative explorations ever undertaken into the role of a transport device and its relationship with a society and its environment. This book surveys the machine's introduction, manufacturing, sales and distribution in Australia, and its broader social impact upon urban society, women, the Australian language, and racing, among other things. Australia is the size of the continental United States. In 1890, beyond the few inland towns of note, it was mostly the province of sparsely distributed agriculturalists, pastoralists, miners, and keepers of isolated telegraph stations and government outposts. There was a need for travel between the widely spaced settlements and isolated homesteads, and the distances travelled were large by world standards; in few other countries did people move so far as part of their regular work routines. The machine's use ranged from rabbit fence patrols and telegraph line repairmen, to nearly all shearers being mounted on them for nearly 2 decades. On the Western Australian goldfields, in particular (an area the size of Arizona, New Mexico, Colorado and Utah combined), the remoteness of early settlements led to the most unusual and extensive network of bicycle paths in the world at that time, based upon camel tracks used to supply mining settlements. The Bicycle and the Bush - Man and Machine in Rural Australia is a must read for Australians suffering from short memory loss. It shows how the bicycle built the land and will hopefully help change the modern perception of the bicycle as being merely a toy for some men in tight-fitting man-made fibres on the weekend. It is also perfect for anyone interested in bicycle history. It's an e-book and it's available at Amazon. At $8.00, you can't afford not to. Don't forget the Subversive Bicycle Photos series from here at Copenhagenize.com. We have photos from Canberra, New South Wales and Queensland.